These are two pumpkins I made that we’re super easy and fast. They are my book page pumpkins and below are the links where I got the basics to make them. I added my own flair with the items that I glued to the stems. These links will help you on how to do the book page pumpkins, super easy and fun. I also went to Thrift Store and bought an old music sheet book and used the sheet music pages to decoupage some other pumpkins. I gave those away before I took a picture so I must make some more. 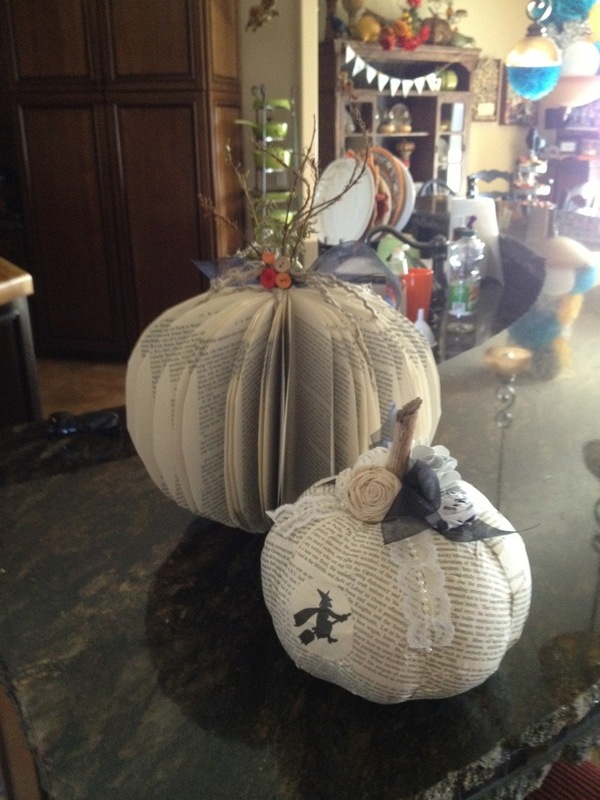 This is a great tutorial on how to make the “Book Pumpkins”. I then decorated the pumpkin stems differently with buttons,tulle, homemade flowers,ribbon etc… This is where you can make it your own. I love these pumpkins and they go so well with all different types of decor,depending on what you add to them, be it whimsical, scary, modern or vintage.Hope you enjoy as much as I did and Thank-you to the women I got the links from. Next: Next post: October 1, 2013 Let the fun begin!